Eiri, a teenage art student, finds a venetian glass that allows him to look into the world of a mysterious beauty. Her soul, trapped for over 250 years, has waited patiently for someone to set her free. Her innocence masks a vengeful heart, and when dark forces are unleashed, determined to atone the sins of the past, Eiri must decided how much he is willing to sacrifice for the one he loves. Like the work of recent Japanese horror (The Ring & The Grudge come to mind), the repercussions of the past, hold very real consequences for those in the present. Eiri’s devotion to Cossette, does not lead him toward pottery wheels, Patrick Swayze and overplayed Roy Orbison tracks; yet he too faces a hellish ordeal - a sacrifice he must make, in order to fulfil his destiny. Lavish scenes of torture position Eiri as a Christ like figure – strung up and attacked both mentally and physically. It seems he has little choice - Cossette consumes his life, and literally scars him. Akiyuki Shinbo uses what we see to build tension - reminding the viewer that Eiri too is constantly being watched, framing him in the reflection of objects that litter the antique shop in which he works. Aware of its audience, sly references like this, litter each episode; be it the fake film grain included, the slight simulated projection stutters, or references to the “horror movie maniacs” watching at home. Its more than just for kicks – it adds a further level to the story, and encourages the viewer to actively seek out meaning underneath the surface. Eiri’s infatuation with Cossette seems to be primarily visual. He speaks of how his time with her has been unforgettable – yet we never see why this is the case, aside of the physical beauty of Cossette herself. It makes his actions questionable, if not a little confusing for the viewer. 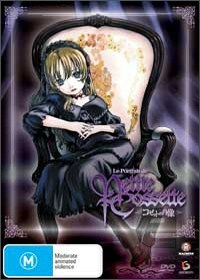 Nevertheless Le Portrait de Petite Cossette works as an unsettling tale mixing of both anime and horror – its unique visual style builds an uneasy feeling in the viewer throughout each moment that will keep you awake long into the night. The review copy contained only the English language audio track, which suffered a need to over explain the obvious, perhaps due to the translation from Japanese to English. The Japanese audio track and series of special features (Staff and Cast Interviews, Music Video Featuring Maria Inoue) were not included for review.